The Electra Forums • View topic - Does anybody know what Model and year this is. Thanks! Does anybody know what Model and year this is. Thanks! Post subject: Does anybody know what Model and year this is. Thanks! Post subject: Re: Does anybody know what Model and year this is. Thanks! Could you post a picture of the headstock and of the back too? Hi, Hope it woked I new at this up loading of pics. Thanks Laurence. It is hard to date one exactly but with the open book headstock and the script logo I would guess 1972-76 range. Hi, thanks for the info. I got this guy that wanted to trade the electra to me for a cheesy Fender squire Stratocaster and because I like Les Paul’s I made the trade. I had bought A Les Paul Custom new in 1975 and unfortunately I sold in 1977 to survive in LA trying to brake though into the music business. So know I have this guitar and it plays almost if not as good as I remember my Les Paul playing. Do you think I made a good trade? If so do you know a ball park what it is worth. Thanks, Laurence. Hello out there, I found a web site (Dr, Zuko’s Electric guitar museum) and from the head stock It looks like I have a 1972 to 1975 Pre lawsuit Supper Rock 2242 The only problem is the color. The face is gold like a super rock 2254 but, the back is black like the 2242 Also the SS# is not on the back side neck medal plate. The plastic head nut plate do's not bare the name Custom,it is just solid black. I hope that it is a prototype or something, that would be cool, or do I have a Frankenstein! your thoughts please. Post subject: Does any body know model and year? Hello out there, I found a web site (Dr, Zuko’s Electric guitar museum) and from the head stock It looks like I have a 1972 to 1975 Pre lawsuit Supper Rock 2242 The only problem is the color. The face is gold like a super rock 2254 but, the back is black like the 2242 Also the SS# is not on the back side neck medal plate. The plastic head nut plate do's not bare the name Custom, it is just solid black. I hope that it is a prototype or something, that would be cool, or do I have a Frankenstein! your thoughts please. Post subject: Re: Does any body know model and year? 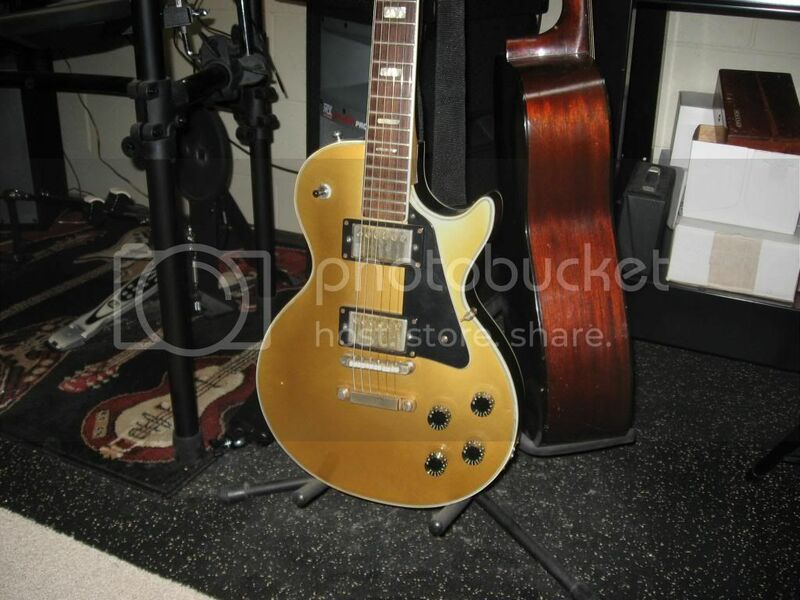 I've seen pictures before of a 2254 with a black back, so it it doesn't look refinished, it could very well be a stock "gold top". Hi, thanks for your input. I also was wondering if anyone know the value of a guitar like this in good condition . Thanks. okay, reviewing catalogs, the '72 catalog shows a 2254 with the black back, and the '74 catalog shows a full gold body, so yours is probably '72-73 timeframe. this are the sales from ebay for 2012 that people have recorded. Any way you cut it, you got the good end of the deal. Thats a great trade man. Congrats. Hi thanks everybody for the ansers to my questions. I was thinking of putting it on ebay. I lost my job and I need the money. Thanks again!